One of my favorite hallmarks of spring is the arrival of rhubarb. Of course there is nothing better than rhubarb pie, but these two recipes couldn't be easier, and skipping the crust eliminates a lot of calories and all of the fat and cholesterol. Which is a good thing, considering they both contain an abundance of sugar. 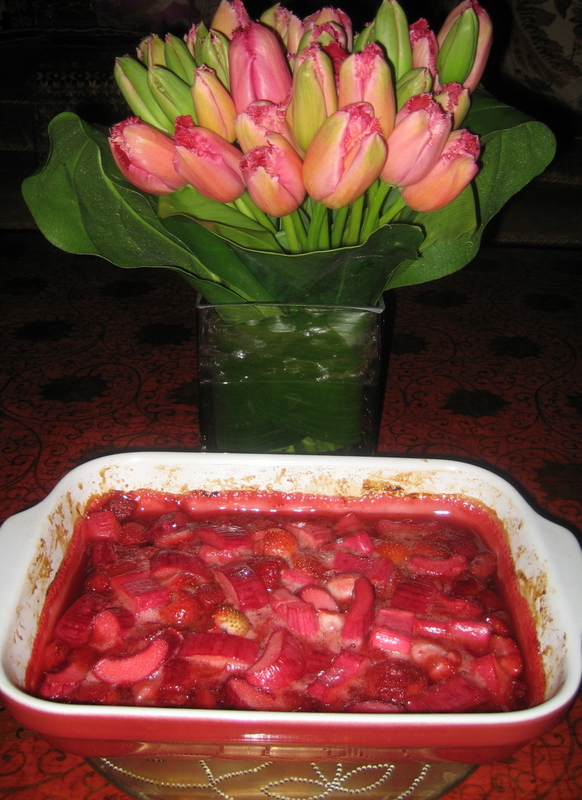 It is important not to cut the rhubarb too thinly, or to slice the strawberries too small. The finished dish should not resemble a compote or chutney in texture, but rather, the pieces should be substantial and hold their shape after baking. Also, I have tried both buttering the dish and dropping bits of butter over the top. There is no point in either, so leave it out. Preheat the oven to 375 degrees, and position the rack in the center. Very simply, combine all ingredients in your baking dish - you know, like a 9 by 13 inch dish, or perhaps a porcelain quiche dish. I would not advise using individual ramekins, because as the fruit settles after cooking it will appear too low. Better too bake as one and later spoon into separate dessert bowls. Besides, I prefer the presentation of a homey dish right out of the oven, with darkened, caramelized edges, like you see above. Allow the mixture to macerate for about 15 minutes, stirring a few times, until the sugar dissolves into the fruit's juices. Slide the dish into the oven and bake undisturbed for 45 minutes. Remove to a rack and allow to rest 15 minutes or longer before serving. Obviously vanilla ice cream would complement well. 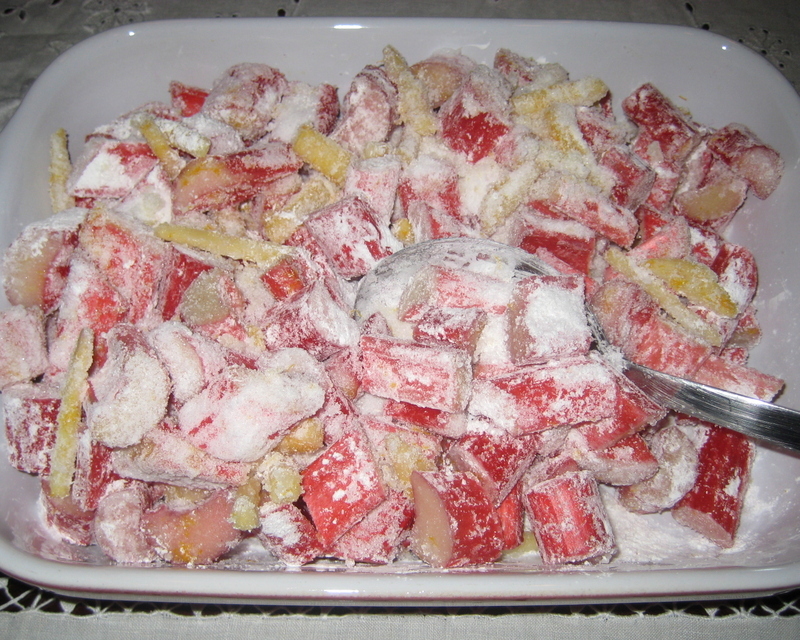 Without the added sweetness of the strawberries, it is necessary to increase the sugar in order to counter the tartness of the rhubarb and the heat of the ginger. Peel the ginger and slice it into think match sticks. If you like the taste of candied ginger, with its sweet but spicy flavor, you will love this dessert. A small amount goes a long way here, but with the orange zest and brown sugar, there is a lovely balance. This photo shows the macerating process before the sugar has dissolved. As with the strawberry rhubarb, toss all of the ingredients together in the dish. When the juices run with the sugar, bake in a preheated 375 degree oven for 45 minutes. Serve with vanilla or ginger ice cream.